Fifty years ago, in 1968, the House of Lords handed down judgments in three key public law cases – Anisminic v Foreign Compensation Commission, Conway v Rimmer and Padfield v Minister of Agriculture – with Lord Reid giving a leading judgment in each. Together with Ridge v Baldwin, a case decided a few years previously also by Lord Reid, these cases would become known as ‘the Quartet’. Together they provide a foundation upon wich the modern law of judicial review is built. This year a Society of Legal Scholars Annual Seminar, held at the University of Sussex on 18-19 May, looked back at the Quartet to see what it can tell us about administrative law today. Using a range of historical, doctrinal and empirical methodologies, the seminar shed new light on the birth of modern judicial review, the competing philosophies that have underlain its development and on the contemporary challenges facing public law in the common law world. The event kicked off with four presentations that placed the Quartet into the legal, political and social context that existed at the time at which the cases were decided. Talks on Ridge and Padfield showed us what we can learn from revisiting the factual background to cases we think we are familiar with. Robert Thomas (Manchester) told us how, in the period leading up to the Quartet, there was a rare consensus between political and legal actors for the need for administrative law reform, noting that RAB Butler, as Home Secretary, criticised the courts for not doing enough to restrain executive power – not something we are used to hearing from ministers today! Maurice Sunkin (Essex) argued that a contextual analysis of Padfield shows how the case served to fortify both the legal and the political constitution – by quashing the minister’s decision the court ensured that the matter ended up coming before Parliament. The presentations on Anisminic and Conway v Rimmer each touched upon something that it is easy for court-focused legal scholars to overlook: the role of the civil service in developing and upholding standards of constitutional propriety in administration. David Feldman (Cambridge) revealed that, in the aftermath of Anisminic, administrators played a key role in mitigating proposals to introduce a stronger ouster clause that would preclude access to the courts entirely. And TT Arvind (Newcastle) and Lindsay Stirton (Sussex) noted that in Conway v Rimmer the court appeared to overlook the standards of good administration that had been developed within the civil service itself – in stark contrast to the way the courts operate in areas such as professional negligence. After lunch we were treated to original empirical research on the Quartet and its aftermath. Two papers used the intriguing methodology of automated content analysis to cast fresh light on Lord Reid’s legacy. Sarah Nason (Bangor) boldly asked whether the Quartet changed anything ‘at the coalface’ – presenting grounds for doubting whether the supposed explosion of judicial review in recent years is really as significant as both enthusiasts and critics tend to suggest. And Joe Tomlinson (Sheffield) analysed the language used by courts and by academics in discussing ouster clause cases, suggesting that the ‘constitutionalist’ terms used by academics fail to capture the more ‘managerialist’ concerns of courts and administrators alike. Daithí Mac Síthigh (Queens Belfast) then gave an analysis of the Quartet’s treatment in England and Wales, Ireland and other common law jurisdictions which concluded with a plea to administrative law scholars for more engaged focus on the fitness of administrative law doctrine for dealing with the functions and structures of the modern state. The session concluded with Richard Kirkham and Dimitrios Tsarapatsanis (Sheffield) asking whether Lord Reid was an activist judge. Using a range of measures to determine an activism/restraint scale they showed that, despite his reputation as a reformer, the empirical evidence does not suggest that he merits the ‘activist’ tag (for good or ill!). The keynote speech was delivered by Supreme Court Justice Lord Reed, who treated us to his own take on the subject broached by his namesake in 1972: ‘the Judge as Lawmaker’. Lord Reed gave us a fascinating insight into his judicial philosophy, giving a measured defence of the declaratory theory of law rejected by Lord Reid – not in the name of ‘mechanical jurisprudence’, nor an opposition to judicial creativity, but out of a conviction that judges should develop the common law by recourse to the principles that are already immanent within it. The second day of the conference began with a session on modern challenges related to the quartet. Robert Craig (Durham) presented on the legacy of Anisminic for modern attempts to oust judicial review, in relation in particular to the forthcoming Supreme Court decision in the Privacy International case, where it will be asked to decide whether the ouster clause in the Regulation of Investigatory Powers Act 2000 is successful in excluding judicial review of the Investigatory Powers Tribunal. The argument offered – that the Supreme Court should uphold the Court of Appeal’s finding that the ouster clause successfully excludes judicial review – sought to resurrect the often obscured distinction between judicial review of administrative and judicial bodies, arguing that Parliament should be understood as intending a subset of judicial bodies (but never administrative bodies) to make errors of law within their jurisdiction. Paul Bowen QC (Brick Court Chambers) offered a consideration of the modern jurisprudence of the Supreme Court which asserts the logical priority of the common law over the Human Rights Act 1998, identifying the various ways in which the common law falls short of the HRA when it comes to protecting rights and arguing, on that basis, that the common law could never offer adequate protection of rights. One notable feature of this talk, and a focus of discussion afterwards, was the inadequacies of the common law’s approach to the award of damages against public bodies, and the desirability of developing a head of damages for breach of common law constitutional rights. The final four papers offered comparative consideration of the Quartet. Justice Daphne Barak-Erez (Supreme Court of Israel) addressed the impact of the decisions in Israeli law, showing however that in many cases the Israeli courts had already addressed similar issues in the period immediately before these cases came before the House of Lords and that the absence in Israel of a tradition of judicial deference may have allowed them to, in effect, forge ahead of courts in other jurisdictions. One interesting point which arose in discussion was that foreign courts do not generally pay as much attention to the decisions of the Israeli Supreme Court as it might deserve, with the emphasis generally placed upon decisions of that Court which deal with exceptional situations and are therefore outliers, rather than the more routine work of an apex court. David Gardner (No 5 Chambers) spoke of the development of the Administrative Court in Wales, discussing some of the issues which have arisen as to the distribution of the case load between the court in London and in Cardiff, and suggesting that perhaps questions of principle should play a greater role in deciding these matters than has so far been the case. Some of the softer distinctions between England and Wales from the point of view of the public lawyer were also brought out, including the difference in approach often apparent as between English and Welsh public bodies. Dean Knight (Victoria University of Wellington) considered the role of the Quartet in New Zealand in the context of a broader debate about the balance between importation and indigeneity, with the discussion about the alleged ‘death of doctrine’ in New Zealand administrative law prompting further discussion about the current status of substantive review in the United Kingdom and what – if anything – is at stake in moving from a spectrum of rationality review to a common law proportionality standard. 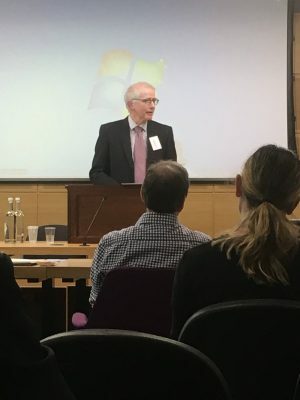 Peter Cane (Cambridge) offered a series of reflections about administrative law in parts of the New Commonwealth, addressing transitions from pre-colonial to colonial and to post-colonial contexts. Distinguishing between models of concentrated and distributed power (exemplified by the United Kingdom on one hand and the United States on the other), Cane suggested that in practice where there are stronger executives courts tend to be weaker, notwithstanding that in such systems of concentrated power, the need for courts to control the executive is greater. In discussion thereafter, much was made of the interaction between the formal elements of power on which the paper had explicitly focussed and the less formal elements which might also have a causal influence. Discussions over the two days showed the potential for fruitful interaction between historical, doctrinal and empirical methods, and the benefits that can be had from taking a closer look at seminal cases – they may feature in our lectures and reading lists year-after-year, but it doesn’t follow that we necessarily understand everything that they may be able to tell us. Changes in the way we are governed, as well as broader changes in society, throw up new challenges for the theory and practice of public law. In working out how best to respond, it can sometimes be useful to reflect upon how the law has responded – sometimes successfully, sometimes not – to periods of change in times gone by. I’m writing this comment listening to The Four Seasons by Antonio Vivaldi, seems pretty apt for what is happening now. From what I understand the Constitution is the set of rules on how we want to live, on what we hold dear to our heart. The picture that I see is this – we say we have the legal constitution and the political constitution – this state of affairs leads people to say to those who want some justice in the legal sphere “That is just a waste of money” and those in the political sphere say “That is just a waste of your time.” These people are all judges in their own court and interpret law as they see fit. Fortunately, writing is still free. Viva la free pen. This entry was posted on May 24, 2018 by Constitutional Law Group in Administrative law, Judicial review and tagged Anisminic, Conway v Rimmer, Padfield, Ridge v Baldwin.